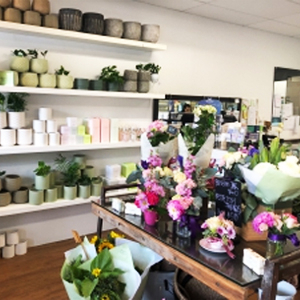 Established in 1994, Manic Botanic is still at the forefront of a wave of floral designers who capture the essence of contemporary style. We deliver to all of the major hospitals, including St John of God Subiaco & Mt Lawley and Murdoch, Royal Perth, Joondalup and Sir Charles Gairdner. Flowers are nice. Delivery was prompt. Recommended. 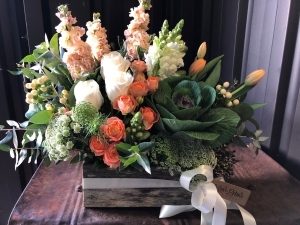 The flowers were fresh and beautifully presented. 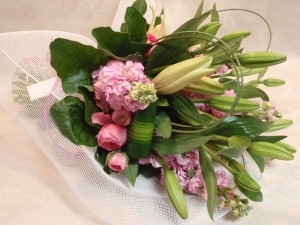 Excellent arrangement of flowers - friends were delighted. A bit boring. I would have liked more colour. It was a lot of money for so few flowers. Although I didn?? ?t see the flowers, I was told they were absolutely beautiful by the recipient who was in much need of some cheering up after surgery. I think this is the only time I ever ordered a flower for Valentines day where I picked a picture that looked really good, but the flower delivered surpassed the picture in every way possible. Absolutely beautiful display which was very well received by the recipient. Stunning. Thank you. Flowers delivered promptly, and I'm told they were very lovely, so I am very pleased. I will use agin if I need to. 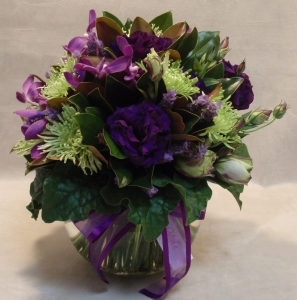 <br/>The pictures my Aunt sent me showed the bouquets looked a little smaller than I thought the website showed, and bore little rememblance to what I chose, so I don't really see the point of the massive choice on the website. It would have been nice to get a delivery acknowledgement - as the website promised. 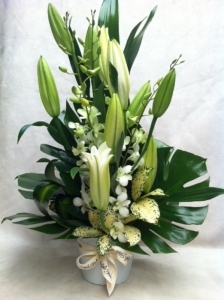 Most gorgeous arrangement of flowers; orchids, roses, sunflowers and wonderful greenery so artfully put together. Recipient delighted. Service was amazing, thank you! 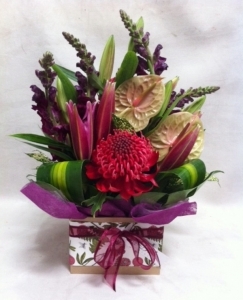 The person who the flowers were delivered to in Australia was very happy with the product of which I was very grateful. Beautiful flowers . Reaquested a morning delivery no problem . 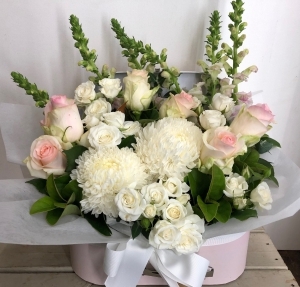 The flowers were fresh and it was a lovely bouquet.Delivery was as requested on day specified?Would definitely use !anic Botanic again. my daughter in law was very pleased with her very unusual arrangement for her birthday . 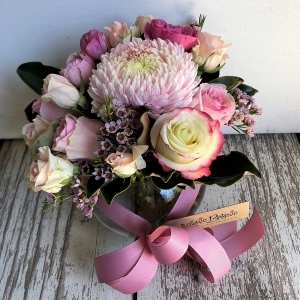 A lovely arrangement .Beautfully done. The flowers were delivered exactly when I requested and they were absolutely beautiful. It is great to be able to rely on an Australian company when we are so far away in the UK. I obviously didn't see them but the people who received them thought they were lovely. 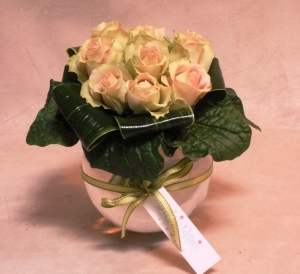 Lovely flowers - much better than another company used last year - easy efficient ordering service - I'll be back! DELIGHTED WITH THE FLOWERS AND EVEN TOOK INTO ACCOUNT THE SPECIAL REQUIREMENTS, WOULD DEFINATELY USE THIS FLORIST AGAIN. Not exactly what I ordered but recipient said they were nice so I'm assuming they were. 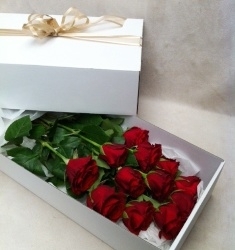 Excellent response from recipient, she loved them! 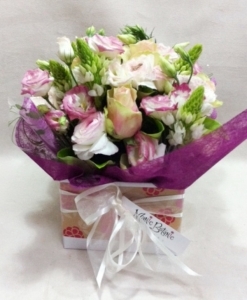 Very nice bouquet arrived on time to Australia, sister was very pleased with quality and choice of flowers. 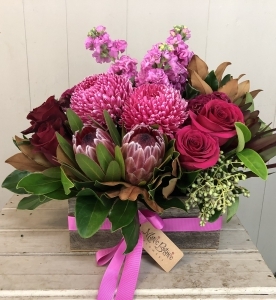 birthday flower from uk to oz for our daughter in law. 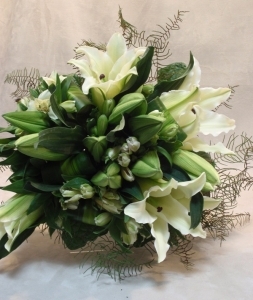 Delivered on time, beautiful flowers, much appreciated, job done. thanks. My friend in Perth was delighted with the gorgeous flowers. I was extremely pleased with the expert website and ease of ordering and quickness of delivery. Thank you so much. 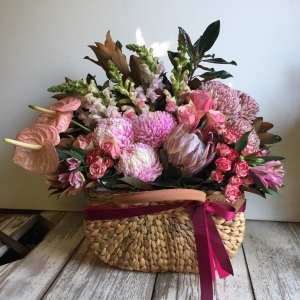 After an initial problem with an incorrect baby hamper being sent to my daughter on the birth of her first baby, Manic Botanic sent a quick apology and sent a complimentary bunch of flower to the new Mum and Dad. So well done. I will definately be using this service again. 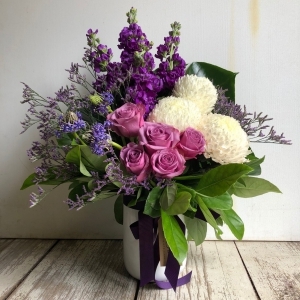 The flowers were beautiful..
A large domed posy style with masses of purple mokara orchids, lissianthus, lavender and magnolia foliage. 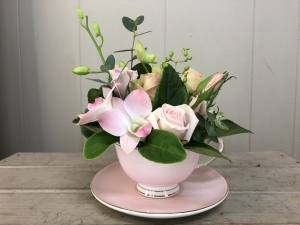 Presented in a lovely fish bowl, this design is perfect for someone that loves something a little bit out of the ordinary. It can also be styled in pastel tones. 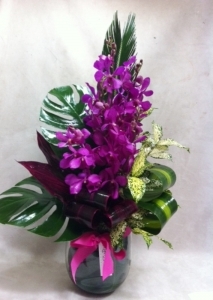 Bright Mokara orchids artfully arranged. Long lasting, and fragrance free. 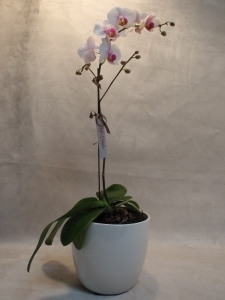 This beautiful orchid plant is available in White or Pink, and will flower for approximately 6 - 8 weeks. 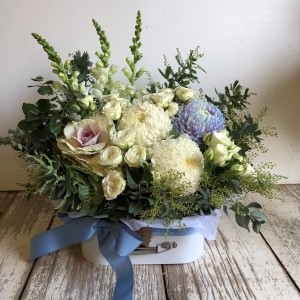 Suitable for corporate or bereavement. Comes with a Manic Botanic gift card.